2012 is a vintage of contrasts with a very mild start of the year and a freezing month of February. A fresh and humid spring, followed by a windy and dry month of July and a very hot month of August. The harvesting conditions were ideal. All these conditions make a great vintage. The 30 hectares of Coudoulet are located just east of the vineyard of Beaucastel on the other side of the A7 motorway. 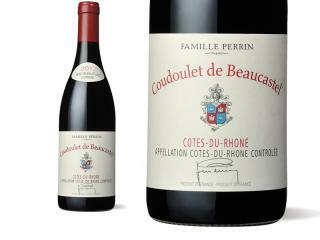 For reasons that have now become obvious, Coudoulet is often considered the baby Beaucastel. The Coudoulet soil has many similarities to that of Beaucastel. It is made out of Molasse seabed covered by diluvial alpine deposits. These pebbles called “Galets Roulés” play a big role: They take in the heat during the day and let it if off slowly at night which gives a good start to the vines in the Spring. 30 hectares in Côtes du Rhône. Molasse seabed of the Miocene period covered by diluvial alpine deposits (rolled pebbles), identical to the vineyard of Châteauneuf du Pape. Each variety is harvested manually and separately, then sorted in the cellar. The harvest is heated to 80°C (skins) and then cooled down to 20°C. Classic maceration occurs in cement tanks for 12 days. Pressing in pneumatic presses. Blending of the different varietals after malolactic fermentation. Ageing in Oak Foudres for 6 months. Appearance: bright and lively, with great depth. Palate: luscious, with hints of thyme. Depuis toujours considéré comme le second cru du Château de Beaucastel (ce qu'il n'est pas, un Châteauneuf ne pouvant se déclasser qu'en vin de table), le vignoble étant à quelques mètres de Châteauneuf-du-Pape, Coudoulet a tout d'un grand vin, sauf le prix. Un incontournable ! Le nez se dévoile sur de jolies notes de fruits rouges, de framboises, de fraises des bois, d'épices et de garrigue. La bouche est puissante, ample, pleine et d'une grande finesse. Les tannins sont veloutés et la finale, d'une belle longueur réglissée. Dégusté à l'aveugle, il se situe au-dessus de nombreux Châteauneuf-du-Pape. Bright and juicy with plum, blueberries and earth; clean, balanced and appropriately rustic; smooth and charming. 30% Grenache, 30% Mourvèdre, 20% Syrah, 20% Cinsault. A juicy, forward and textured example of this cuvee (especially when tasted next to the 2013), the 2012 Coudoulet de Beaucastel Côtes du Rhône has juicy blueberry, garrigue and lavender notes to go with a fleshy, medium to full-bodied feel on the palate. Soft, with low acidity and a hard-to-resist feel, it has just enough tannic grip to keep it years. Youthful purple. Spicy, highly perfumed dark berry and Indian spice scents show very good clarity and pick up a smoky nuance with air. Densely packed but lithe too, with juicy black and blue fruit flavors and a touch of lavender adding lift. Dusty tannins shape the finish, which clings with impressive tenacity and subtle spiciness. According to Marc Perrin, the vines that provide the fruit for this wine are now over 80 years old. A floral, open style, with honeysuckle and orange blossom notes leading the way, backed by an enticing core of white peach flavors. A flicker of talc adds length on the pure finish. Drink now. 250 cases imported. Dark deep crimson. Intense, tarry fruit. Marked acidity and tannin. Dry finish. A bit pinched at the moment.